PENALTIES have become a feature of Crumlin Star’s season and they were again forced to go the distance against Annagh United in their Intermediate Cup quarter-final re-fixture on Tuesday night. The original game was abandoned just shy of the hour mark following a serious injury to defender Paul Prigent, who has been ruled out for the rest of the campaign with a fractured ankle and torn ligaments. Annagh were ahead 2-0 at the time and, as such, were installed as strong favourites to progress to a last four meeting with Banbridge Rangers. However, having knocked Championship 1 outfit Loughgall out of the Irish Cup at the fifth round at the beginning of the year, Crumlin Star produced another cup upset at Tandragee Road. Striker, James Doyle scored twice as the game finished 2-2 after 90 minutes and extra-time failed to produce a winner so penalties were required. The visitors held their nerve to claim a 4-3 win in the shoot-out, much to the delight of their manager, Paul Trainor. “We deserved to win the game to be honest. It would have been a terrible shame if we haven’t have gone through,” said Trainor. “I understand they (Annagh) are feeling aggrieved after being 2-0 up. At the end of the day, that was out of our hands as they didn’t have a stretcher for Paul (Prigent). Crumlin’s performance was even more remarkable considering they were reduced to 10 men before half-time with Mark Lyons picking up two bookings in the first half. Tuesday night’s game was the second time the North Belfast men have needed penalties to progress in the Intermediate Cup after they also beat Bangor 4-2 on penalties in the previous round after that game also finished 2-2 after normal time at Clandeboye Park. They’ve had mixed fortunes in other cup competitions, however. Before Christmas, they lost out to Sirocco Works after a shoot-out in their Steel and Sons Cup semi-final at Seaview before winning the Border Cup at the same venue later in December against Ballynahinch Olympic on penalties. Remarkably, they lost their grip on the Clarence Cup a few days later when Abbey Villa defeated Crumlin Star 7-6 following a penalty shoot-out. Trainor feels his side’s never-say-die attitude has stood to them this season and is perhaps the reason why they’ve had so many games going to the wire this season. “They don’t know when they are beat – they just keep going,” stated Trainor. “Last night (Tuesday), they were outstanding. They ran all over Annagh, our fitness came into play. Annagh had their strongest team out and we were just too quick for them. We just wanted it more. “In the league game against Shankill United, we were 1-0 down and came back and won 2-1. In the Border Cup final, we were 1-0 down and got the equaliser in the last minute. 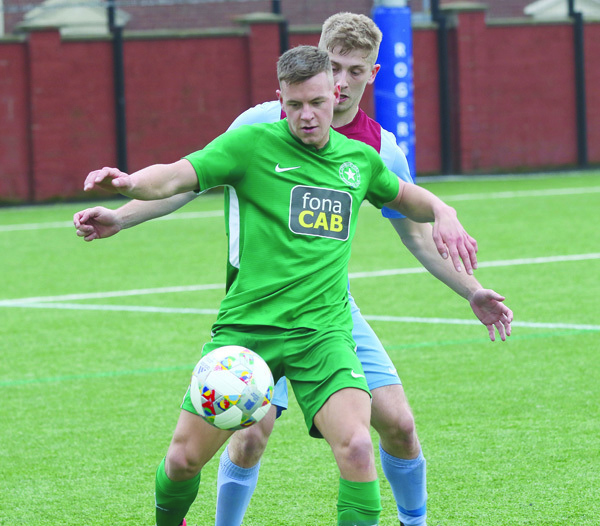 Star’s reward for the exploits is a semi-final clash with Banbridge Rangers on Tuesday, April 3 with Armagh City’s Holm Park rumoured to be the venue and Trainor expects another tough battle. “They (Banbridge Rangers) are in the Mid-Ulster league and they beat Crewe 5-2 on Tuesday,” added the Crumlin Star boss. “We know two or three of their players. I’ve a few clips of them and we’ll get someone to go and watch them over the next week or so. I think they are a big, strong team and play off a lot of set pieces. The immediate focus for Trainor’s side will be Saturday’s league game against Downpatrick at the Cricky (2pm). The defending NAFL Premier Division champions remain 12 points behind leaders Immaculata, but now have nine games in hand. Next weekend also sees the start of the Antrim senior football leagues with key players Joe and Aidan McNeill among those who feature for Ardoyne Kickhams. Trainor reiterated the need for dialogue between all parties to ensure the players aren’t being overburdened as the fixtures begin to pile up. “A few of the boys will be starting up with the Gaelic in the next few weeks,” said Trainor. “I think they have it sorted at this stage. They don’t need to be bursting their pan in doing pre-season work for the Gaelic teams – they are fit already. If they did, they would be no good to the Gaelic teams by the time our season is over.